when you feel like your heart is bursting with love compared with trying low moments when you feel like your home has been taken over by a monster - Or a dinosaur. Jane Yolan and Mark Teague’s (illustrator) whimsical children’s book, “How Do Dinosaurs Say I Love You?” captures the high emotions of parenthood in clever, colorful illustrations; while also providing a good-natured message or reassurance to adults and children alike. Younger readers will enjoy the colorful illustrations of actual dinosaurs, including species like Tsintaosaurus and Nothosaurus, as they alternately wreak havoc in the human world and warm their parents’ hearts with spontaneous loving gestures. Those same parents, meanwhile, delight in the bewildered expressions of the illustrated human caretakers as they watch their wild dinosaur children run screaming across the playground or throw spaghetti into the air during a dinner disaster. Because, while two-year-olds are objectively small and adorable, trying to get one to cross a parking lot can feel like you’re dragging a Triceratops; and driving with a child in tantrum-mode is just like being stuck in a sedan with a Pachycephalosaurus. It’s rare to find a children’s book whose language and illustrations stand up to repeated viewings by parents and kids alike. Yet “How Do Dinosaurs Say I Love You?” is one of those rare and wonderful picture books that can be enjoyed over and over. Small children will be reassured that, yes, parents love their little dinosaurs no matter what. And parents will be similarly cheered by the gentle reminder that the many challenges of raising children are universal. 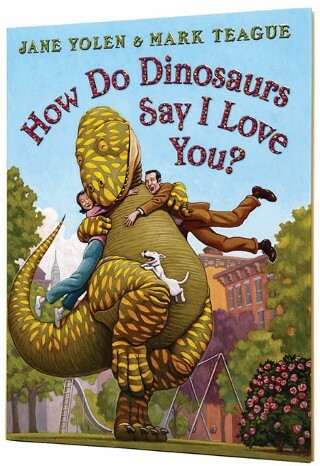 You can find a copy of “How Do Dinosaurs Say I Love You?” in the children’s section of the Raymond Village Library.